Boarding starts at 15.30 from Bodrum Harbor. On the first day, our boat will remain anchored in Bodrum Port for dinner and stay at the port an overnight. Bodrum has a history that goes back to the 12th century B.C. The city was called ‘Halicarnassus’ and it was the birthplace of Herodotus;the ‘Father of History’ who lived in the 5th century B.C. The ‘Mausoleum’ of king Masusolus (350 B.C.) one of the seven wonders of the world is in this city. The only structure that survived from the Classical Era is the Amphitheatre. It is one of the oldest theatres in Anatolia with a capacity of 13.000 guests and it is still hosting many shows and concerts for the art-lovers of Bodrum. Another place that you should visit when you arrive in Bodrum is the landmark of the city, the ‘castle of Saint Peter.’ It is one of the best preserved pieces of architecture with a history dating back to the Middle Ages. “Myndos Gate” through which Alexander the Great entered Halicarnassus is another place that you should not miss to visit. After your breakfasr, you will be informed about the cruise itinerary and the boat. Then we weill cruise to Orak Island. 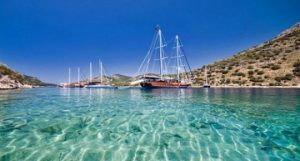 Here you will have the opportunity of swimming in the crystal-blue waters of Orak Island and enjoying lunch,we will then sail to Cokertme, a small and picturesque fishing town, for dinner and an overnight stay. If the weather conditions permit, it may be possible to use the sail on the way. Guests are welcome to take a short walk on the shore. We will cruise to Seven Islands before breakfast, early in the morning. 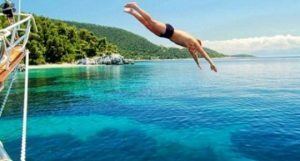 You will experience another excellent day in the Seven Islands region, which is full of many small islands and coral reef; it is recommended that you should dive,swim,sleep and rest. Our huests can also enjoy a walk in the forests, filled with pine trees. Our first stop in the Seven Islands region will be Kufre Bay. 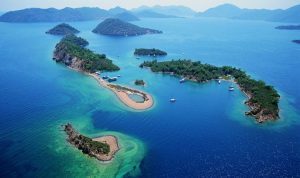 Then we will be anchoring at Uzun Liman(Long Port). Afterwards we will cruise to English Port for dinner and overnight stay. The name English Port comes from the time of World War II, as the ships of British Navy forces used to dock here. In this area, there are many small and large bays which are suitable and sheltered enough to anchor for boats. We will cruise to Sedir ( Cedrea) Island. This unique island with its small beach and unbelievable clear water is like an open-air museum. You can see the city walls, the temple from time of Dorians’ reign (later restored as a church), the amphitheatre with 1500 guest capacity and some vaulted historical buildings. You can walk around the wrecks of pillars with antique writings on them or the ancient stones decorated with reliefs. Cleopatra Beach, located on this island, has a very special kind of sand that can be only found in the deserts of Northern Africa. According to myth, King Antonius brought the sand from Egypt via sea for Cleopatra. Then our boat will sail to Karacasogut village for dinner and spend the night there. This lovely village is located at 25 km away from Marmaris. Therefore, it is possible to visit Marmaris via ‘dolmush’ (mini buses) if you wish. We also have an optional tour to Dalyan-Caunos. Morning swimming will soon become a part of your daily activities. For lunch, our captain will cruise to Longoz Bay; another place just like paradise,sheltered with huge pine forests. After lunch you can enjoy a short walk in the forest and take a rest in Ali Baba’s local shed-like cafe. 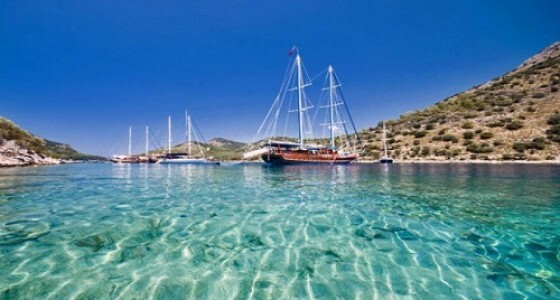 Afterwards the gulet will be anchoring at Tuzla Bay to enjoy a swimming break in the turquoise-blue waters. Dinner and overnight stay will be at Tuzla. We will be at Kargili Bay (Molla Ibrahim Bay) early in the morning. After lunch, we will be anchoring at Kisebuku ( Alakislabuku), where you can see ruins of the Byzantines. We will spend the night in this lovely bay. We will sail to PAbucburnu after breakfast and enjoy lucnh here. Tea will be served in Yaliciftlik Bay. An optional village tour can be arranged from this bay for those who wish to experience local life. Then we will cruise back to Bodrum Port for our last dinner and overnight stay. Guests will leave the boat with precious memories by 10.30 am, after breakfast. *IMPORTANT NOTE: The A/C can be in use up to 8 hours daily, the use of the A/C in harbors is strictly forbidden. Depending on sea and weather conditions, yachting company reserves the right to make necessary changes to the tour itinerary to ensure the safety and comfort of our guests.